If you notice a horizontal scroll bar on any of our pages please let us know. In my searches I haven't found exactly the pattern you are describing. Lift up your eyes on high and see who has created these stars, the One who leads forth their host by number, He calls them all by name; because of the greatness of His might and the strength of His power not one of them is missing. Now faith is the assurance of things hoped for, the conviction of things not seen. For by it the men of old gained approval. By faith we understand that the worlds were prepared by the word of God, so that what is seen was not made out of things which were visible. And He is the image of the invisible God, the first-born of all creation. For by Him all things were created, both in the heavens and on earth, visible and invisible, whether thrones or dominions or rulers or authorities -- all things have been created by Him and for Him. And He is before all things, and in Him all things hold together. He is also head of the body, the church; and He is the beginning, the first-born from the dead; so that He Himself might come to have first place in everything. "GOD'S GLORY SHINES THROUGH HIS CREATION." What did God create on the seventh day? Always work the gauge swatch with the hook you intend to use for the final project. What happened to your new website, now I have to continously slide the page from left to right to enable to see it, what happened???????? The whole page is much too wide. Which page is like that? issue of the newsletter but it has been corrected. NOTE: If you experience this problem with any of our pages please email me. Hello, My name is , Chelsea Smith, I am fourteen years old and I Just learned how to do a single stich crochet just by my aunt showing me, I am so confused on how to read sewing patterns! Do you have any tips for me that would make it easier... or how you learned? I would love to try some of your patterns that looked so pretty! 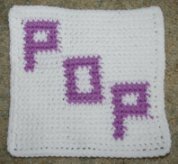 I thought crocheting would make great Christmas Gifts and inexpensive ones at that! I just make my lil cousin, she's about eight, a multi collar scarf, it looks really nice, and it's the first crocheted item I have ever made... (other than covering hangers, which I am not sure is even crocheting) Thanks Chelsea Smith. Congratulations on learning the single crochet stitch. 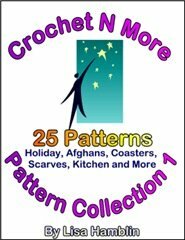 Crochet patterns aren't difficult to read once you understand the terms. You already have an advantage... internet! This is my list of crochet terms and instructions. Choose a pattern and use that list to refer to so you know which stitch to do. 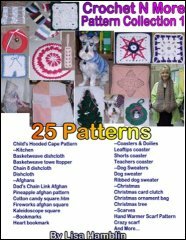 Do you have a particular type of pattern you want to make? I have not designed any shrug patterns personally. Yes, we are Christians... glad you liked the Jesus fish... hubby just added that to our pages. 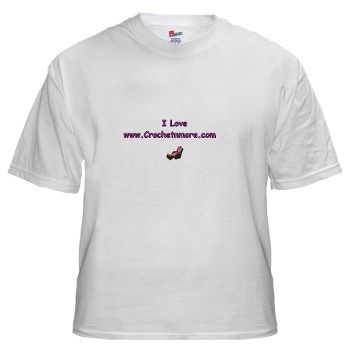 He has been working very hard on redesigning the Crochet N More website. 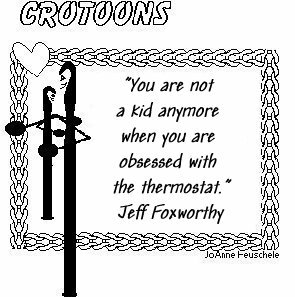 Today's issue of the Crochet N More Newsletter is scheduled to go out shortly... enjoy! I have been looking at your website for a baby bonnet to crochet and I found an adorable one that I want to try. While I was on the site, I began to read through some of the links and was very inspired by your testimony about what God has done in your life. I think we can all relate to the little (and big) miracles that God gives us. I hope your family is doing well and you are still enjoying God's blessings. Thank you for your dedication and wonderful work. 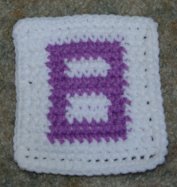 To work a "3tr tog" you work each of the 3 treble crochet stitches without completing the very last step of each one. Then yarn over and draw through all the loops on the hook. Oh Lisa, I absolutely LOVE this pattern! You have designed some great stuff, but this one is so perfect. I needed something for a Halloween Bingo prize. I did it in less than an hour. Thanks so much for designing this - just for me of course . 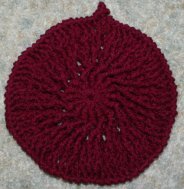 Hugs, Lois K.
I do not have a cupcake hat pattern on my site. I'll be happy to help you figure it out. (sc in next ch-4 sp, ch 4) across ch-4 sps of corner??? What does across mean hear? It's found in a Lion Brand Motif Scarf pattern. This means you work a single crochet in the next chain 4 space, then chain 4. 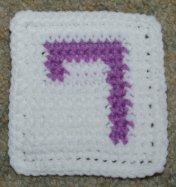 Keep doing that until you have a single crochet in each of the chain 4 spaces of your corner. Don't for get that last chain 4 to finish the last repeat. Now continue with your other instructions. I am fascinated by your X Marks the Spot afghan square. With each of my 6 grandchildren, I have always done the "x marks the spot" little saying on their backs and they always ask for it. I would like to make this for each of them. I have a question... when you change from the mc to the cc color, what do you do with it (obviously, you don't cut it). I would love to make this. X marks the spot, with a dot, dot, dot, and a line, line, line... and a question mark? Dribble up, dribble down, dribble all around. A little ocean breeze, and a squeeze. This is all drawn (and dotted and question marked) on their back going up and down and all around, for the ocean breeze, you blow a little wind on their neck and gently squeeze. So now I think you know why I want to make this square. I carry the unused color along the top of the stitches and work over it as I go along. I drop the unused color at the point where I will need it again on the next row. My daughter and I were discussing body image the other day and I explained that nearly every woman has a part of their body they aren't satisified with. I went on to say that some of the slimmest women in the world have cellulite. I'm not slim by any means but cellulite is one of my figure flaws. My daughter told me those little indentations on my backside were "dimples"... and that meant that my backside was laughing. During my surgical residency I was called out of a sound sleep to the emergency room. Unshaven and with tousled hair, I showed up with an equally unpresentable medical student. In the ER we encountered the on-call medical resident and his student, both neatly attired in clean white lab coats. The resident said to his student, "You can always tell the surgeons by their absolute disregard for appearance." Two evenings later, I was at a banquet when called to the ER for yet another emergency. I was stitching away - wearing a tuxedo - when I encountered that same medical resident. He looked at me, then said to his student, "Sure is sensitive to criticism, isn't he?" Trying to explain to our five-year-old daughter how much computers had changed, my husband pointed to our brand-new personal computer and told her that when he was in college, a computer with the same amount of power would have been the size of a house. Wide-eyed, our daughter asked, "How big was the mouse?" While working as a mall Santa, I had many children ask for electric trains. "If you get a train," I would tell each one, "you know your brother Mike is going to want to play with it too. Is that okay?" The usual answer was a quick yes. But after I asked Donnie this question, he became very quiet. Trying to move the conversation along, I asked what else he would like Santa to bring him. A man having lunch at a Chinese restaurant noticed that the table had been set with forks, not chopsticks. He asked why. The Kindergarten Sunday School class was discussing "prayer", and the children seemed aware that the way you end a prayer was with "amen." Does anyone know what "amen" means, the teacher asked. There was a long silence. Then one little boy piped up, with appropriate, computer-age gestures, and said, "Well, I think it means, like, "Send." Meggie came home from grade school one day and told her dad that she wanted to be a cupcake. Scratching his head, her daddy asked, "Why do you want to be a cupcake?" "I want to join the girls and earn badges and go to camp," said Meggie. Her dad grinned and said, "Honey, you don't want to be a cupcake. You want to be a Brownie." Jimmy was having problems in English class, so his teacher decided to stop by on her way home to speak with his parents. When she rang the bell, Jimmy answered. "I'd like to talk to your mother or father," said the teacher. "Sorry, but they ain't here," he told her. "Jimmy!" she said, "what is it with your grammar?" "Beats me," Jimmy replied, "but dad sure was mad that they had to go bail her out again!" Sunday after church, a mom asked her very young daughter what the lesson was about. The daughter answered, "Don't be scared; you'll get your quilt."